Owner/President/Merchandise Manager Jeanie, as a founding partner in Alfresco Living, is the creative force behind all of our marketing, graphic design, print advertising and photography. Jeanie is actively involved in new product research, financial oversight, and new business development. As merchandise manager Jeanie oversees the specification and ordering of all our garden products. 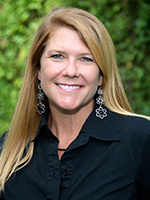 Jeanie also coordinates with our team of landscape architects and designers completing their design with the finishing touches necessary to achieve world class results. Providing personal service with our homeowners, architects, interior designers, landscape architects, and property managers throughout Florida, the United States, and the Bahamas to decide which pieces are best for each garden space. Jeanie has developed a strong relationship with artists, craftsmen, and vendors locally and from around the world. Jeanie received a Bachelors of Design from the College of Fine Arts at the University of Florida after studying fine arts for one year at Flagler College in St. Augustine. Jeanie has also completed the Rollins College Crummer Business Management Program. Jeanie is an artist in her own right with many different endeavors at any one time. Jeanie and Scott have two awesome children together, Abby and Beck. Owner/Vice President Scott’s vision for Alfresco Living came from being aware of a void in the Central Florida market for accessible garden ornamentation. Scott is a landscape architect dedicated to designing creative and striking gardens and landscapes. Knowing that many of his landscape designs would benefit from having just the right sculpture, fountain, or fire feature the research began. It has been a policy from the start that we would share this knowledge with other landscape architects, builders, and home owners. Scott has traveled many parts of the world in an effort to understand the individual elements that compose timeless and memorable spaces and experiences. 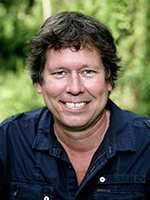 Scott has designed award winning gardens for over 25 years, with a passion for understanding classic design – but always exploring new technologies and materials. Scott is actively involved in all aspects of design, specification and product research. Please visit RedmonDesign.com to see more of his design work. Business & personal checks accepted and preferred. See terms and conditions for card acceptance.